I love spending time in Supermarket around Christmas and New year eve. I do not know if it is the same for you in your home country, but in Switzerland they fill shelfs with full of products that are usually difficult to find. 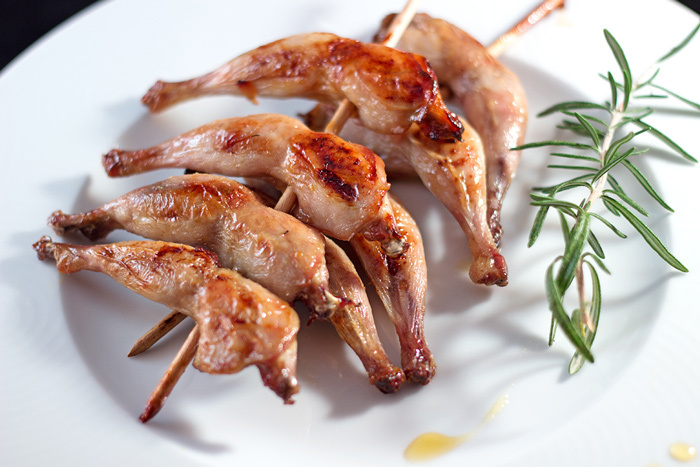 I saw these quail legs and immediately thought about my birthday dinner. I wanted to make a large seafood platter with oysters. I am in love with oysters. There are so tasty. However Adrien is not a big fan. So I thought I could make something quick apart from seafood. 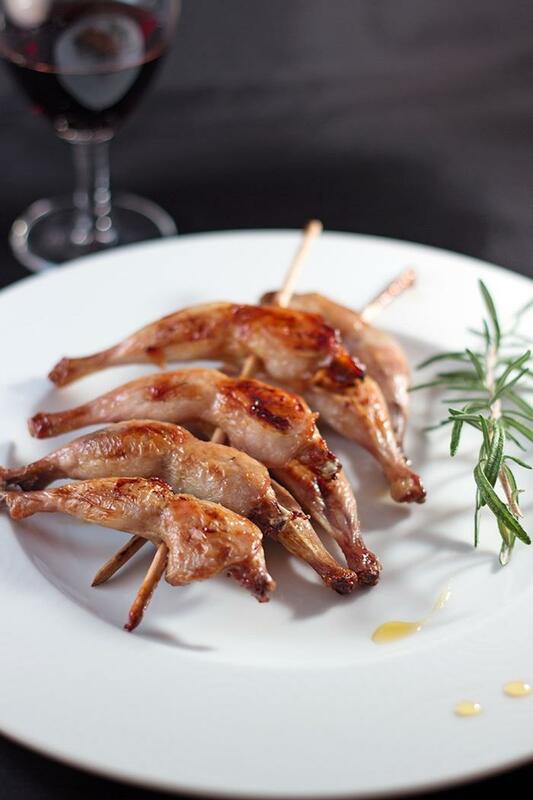 This was the perfect plan we really like quails too and quail legs are the best part. This honey and rosemary glaze is easy and fast to make. I used some fresh rosemary that I got on my balcony. Despite of the weather, I hope that my aromatic herbs will stay alive and pass winter. The result was delicious and I regret to not have made more. But my stomach was full with oysters and foie gras already. So I could not have eaten an extra skewer. 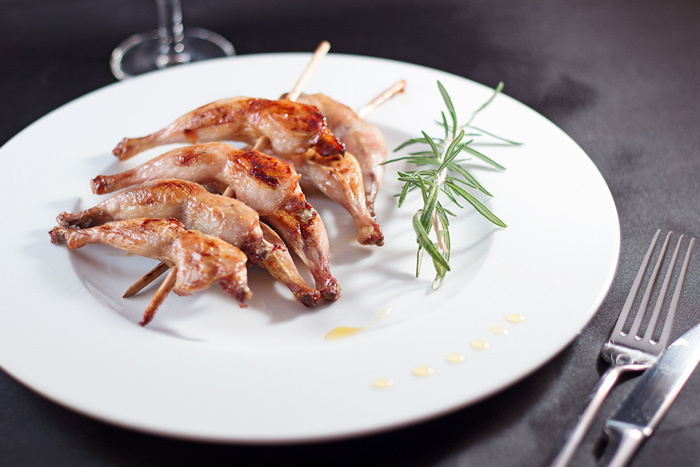 I would advice you to serve these quail leg skewers with mashed potatoes. Enjoy. Pour white wine in a medium sauce pan. Leave to cook until quantity reduced by half. Add honey and leave to cook few minutes until you see huge bubbles. Take few drops and drip on a clean plate. If the glaze immediately solidify, remove from heat and reserve. 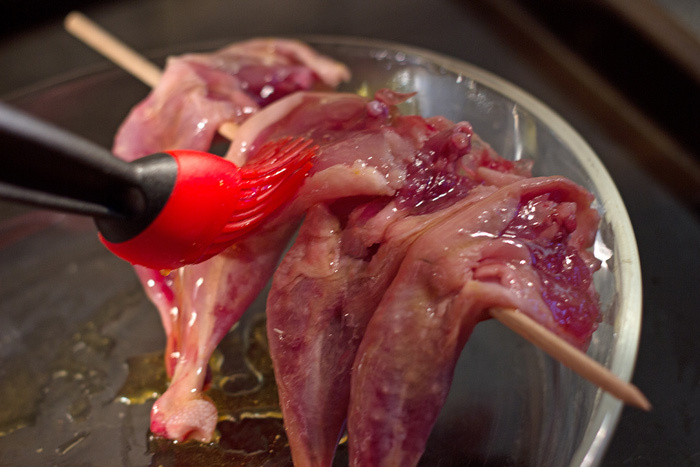 Stick 4 quail legs on each skewer. Cover with glaze and bake for 20 minutes. Turn half way through cooking time and moisten regularly with gravy. Thank you very much for reading. 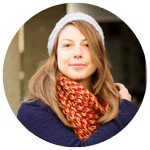 Register to the newsletter and follow me on social media to receive the latest recipes of a French girl “cuisine”. The rosemary honey glaze sounds wonderful. We don’t get quail round here unfortunately so I’ll have to use chicken or duck. Thank you very much Virginia. Oh, it’s too bad. Love quails.